Hey, Hey, It’s The Monkees (and Saint Matthew and Bob Dylan and The Holy Ghost)! Davy Jones’ premature death last month was only the most recent (and visceral) in a long line of Monkee tragedies. 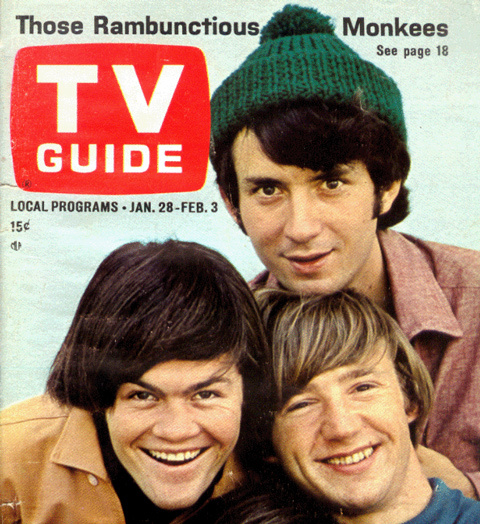 Journalists have done their best to respect the late entertainer, shoring up The Monkees’ legacy by mentioning their influence on such contemporary attempts to manufacture prefab chart-toppers as American Idol and The Voice. And they’re not wrong. The Monkees do represent one of the more crass meetings of commerce and art in the TV-era. But the larger tragedy is that most people think that’s all they were. The singles speak for themselves: “Last Train to Clarksville” “Valleri” “Listen to the Band” “Pleasant Valley Sunday” and, of course, “Daydream Believer” are as good and authentically joyful as any pop music ever produced. And 100 years from now, one wonders how much the context will matter… Plus, as a diehard Elvis fan, I’m certainly not going to start towing the indie line and holding non-songwriter’s singing talents against them now. The irony, of course, is that The Monkees actually had a world-class songwriter in their midst, Mr. Michael Nesmith (the tall one with the funny hat). Nesmith has been called the true progenitor of ‘country-rock’, and I’m inclined to agree. That is, as wonderful as Gram Parsons may be, he’s simply the sexier version of the real thing, inadvertent evidence of the cognitive dissonance involved in giving a Monkee credit for something so unabashedly genuine. I don’t expect to convince anyone on that point, and I’m not sure it’s ultimately of any great importance. Suffice it to say, Nesmith’s songs, many of which went unreleased (tragically so! ), are all fantastic; they comprise one of the 60s great ‘lost’ albums. This is the Nazareth Principle at work in a big way. Which brings me to “St. Matthew”, one of Nesmith’s most brilliant recordings with his original band, put to tape in 1968 without seeing the light of day until the mid-80s. The title hooked me immediately–not to mention all the, um, hooks in the song–but then I stumbled upon a quote from Mike about the song, which officially rocketed it into that small but glorious club known as The All-Time Greatest Mockingbird Finds. She calls herself St. Matthew when she is on the run. But, most of it is weariness from standing up, trying not to kneel. The girl that’s named St. Matthew when she is on the run. Michael Nesmith is a genius! I’ll never forget seeing him play in the round at the Bluebird Cafe in Nashville – in the mid-90s, I think? Simply perfect. Check out this gorgeous rendition of “Joanne,” one of the most beautiful songs ever written…. Thank you so much for posting that! One of my absolutely most favorite Nez songs, but I never knew what he meant.